I’ll be in Detroit for the next few days enjoying the annual meeting of the American Association for State and Local History. I’ve been a member for about 40 years and I don’t think I’ve missed a conference during the last decade—does this make me a history nerd? 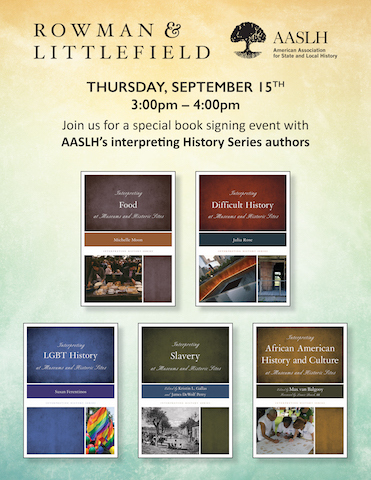 I hear this conference will be among the largest in AASLH’s recent memory and in partnership with the Michigan Museums Association, they’ve assembled some intriguing sessions and events. As usual, I’ll have to split myself to attend several sessions at the same time but spending Saturday afternoon at the Henry Ford Museum and Greenfield Village will be the highlight. Friday, September 16 at 2:15 pm: After the Financial Crisis: Putting the Pieces Back Together. Joining me will be Donna Sack of Naper Settlement. I’ll be writing a follow-on article for History News on embezzlement at museums and historic sites, so if your organization has been a victim and you’re willing to be interviewed, please contact me. Saturday, September 17 at 9:00 am: Can You Handle the Truth? Interpreting Sensitive and Difficult Topics. Joining me will be Christian Cotz of James Madison’s Montpelier, Callie Hawkins of President Lincoln’s Cottage, and Julie Rose of the West Baton Rouge Museum. Mary van Balgooy, my wife and partner at Engaging Places LLC, will be moderating the session, “Where the Girls Are: Public History IS Women’s History” on Saturday, September 17 at 9:00 am with Sue Ferentinos, Michelle McClellan, and Marla Miller. If you’re looking for exhibit designers, new merchandise for your store, or books about house museums and historic sites, the Exhibit Hall always has a lot to offer. I usually cruise it twice and this year it’s also the spot for a cheap lunch ($10 on Thursday!). Rowman and Littlefield will have the latest books in their Interpreting series (including mine on African American history and culture) but you may want to stop by on Thursday from 3-4 pm because several authors (including a few contributors to my book) will be on hand to say hello and better yet, it’s rumored that R&L will be offering a special deep discount during that hour as well as a coupon for forthcoming books. During the conference, I’ll be tweeting out pithy quotes and snapshots from the sessions, so follow #AASLHMMA2016 (waaay too long for a 140-character message). I’m going to experiment with Periscope, so you may see some short videos as well to get a better sense of what’s happening (although it could be hampered by the lack of a signal deep behind the concrete walls of the convention center). You’ll find me on Twitter @MaxVanBalgooy. This entry was posted in Historical interpretation, Resources, Training and tagged American Association for State and Local History, Callie Hawkins, Christian Cotz, Donna Sack, Julie Rose, Marla Miller, Michelle McClellan, Michigan, Rowman and Littlefield, Sue Ferentinos, Twitter on September 14, 2016 by Max van Balgooy. Yes, yes it does — and don’t ever change. Have I told you lately how much I look forward to your posts? Yours is the only blog (among the many that I subscribe to) that I take the time to read–no matter how busy my day is–for fear of missing out on a timely gem that will help me do my job better. Thank you Max and Mary for all you do.